Soldering iron tips are compatible with majority of soldering irons from various manufacturers, and may vary in size and shape for different types of work. 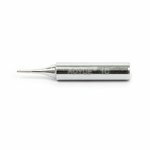 Replacement Conical soldering iron tip (15 mm, ⌀ 0.5 mm) for precision component soldering. Compatible with ATTEN AT100D, AT201D, AT204D, AT60D, AT80D, AT937B, AT938D, AOYUE 701, 701A+, 936, 937, 937+, Lukey 936+, AOYUE 950+, AOYUE 738, 768, 899A+, 906, 906C, 908+, 909, 968, Lukey 702, 850D, 852D+, 852D+FAN, 852D-300-301, 853D+, 868, 898, HAKKO. 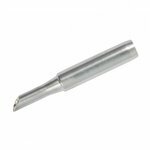 Replacement conical soldering iron tip for precision component soldering (25 mm). Compatible with ATTEN AT100D, AT201D, AT204D, AT60D, AT80D, AT937B, AT938D, AOYUE 701, 701A+, 936, 937, 937+, Lukey 936+, AOYUE 950+, AOYUE 738, 768, 899A+, 906, 906C, 908+, 909, 968, Lukey 702, 850D, 852D+, 852D+FAN, 852D-300-301, 853D+, 868, 898. 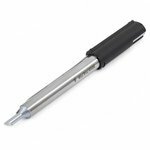 Long-life Knife Type soldering iron replacement tip (15 mm) for precision component soldering. 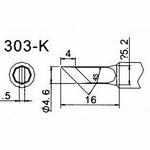 It is compatible with ATTEN AT100D, AT201D, AT204D, AT60D, AT80D, AT937B, AT938D, AOYUE 701, 701A+, 936, 937, 937+, AOYUE 950+, AOYUE 738. Conical soldering iron tip (13 mm, 0,2 mm). Compatible with AOYUE 701, 701A+, 936, 937, 937+, ATTEN AT100D, AT201D, AT204D, AT60D, AT80D, AT937B, AT938D, Lukey 936+, AOYUE 950+, AOYUE 738, 768, 899A+, 906, 906C, 908+, 909, 968, Lukey 702, 850D, 852D+, 852D+FAN, 852D-300-301, 853D, 868, 898, HAKKO. 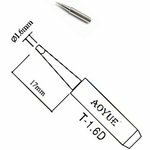 Replacement conical soldering iron tip (17 mm) for ATTEN, AOYUE, Lukey, Pro'sKit soldering equipment. 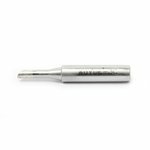 Replacement soldering iron tip with double-sided cut for precision component soldering (17 mm, ⌀ 0.8 mm). It is compatible with ATTEN AT100D, AT201D, AT204D, AT60D, AT80D, AT937B, AT938D, AOYUE 701, 701A+, 936, 937, 937+, Lukey 936+, AOYUE 950+, AOYUE 738, 768, 899A+, 906, 906C, 908+, 909, 968, Lukey 702, 850D, 852D+, 852D+FAN, 852D-300-301, 853D+, 868, 898, HAKKO. 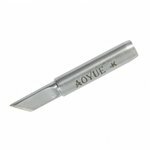 Replacement soldering iron tip (45°,17 mm) with one-side cut for ATTEN, AOYUE, Lukey soldering equipment. 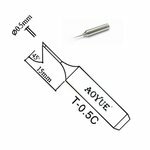 Replacement bevel type soldering iron tip (60°, 15 mm) for ATTEN, AOYUE, Lukey soldering equipment. 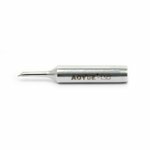 Replacement soldering iron tip (15 mm, ⌀ 1 mm) with one-side cut (60°) for precision component soldering. Compatible with ATTEN AT100D, AT201D, AT204D, AT60D, AT80D, AT937B, AT938D, AOYUE 701, 701A+, 936, 937, 937+, Lukey 936+, AOYUE 950+, AOYUE 738, 768, 899A+, 906, 906C, 908+, 909, 968, Lukey 702, 850D, 852D+, 852D+FAN, 852D-300-301, 853D+, 868, 898, HAKKO. 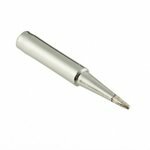 Long-life bevel type soldering iron replacement tip (45°, length 17 mm, diameter 2 mm) for precision component soldering. It is compatible with ATTEN, AOYUE, Lukey, Pro'sKit soldering equipment. 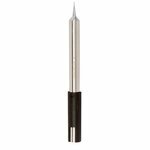 Knife type replacement soldering iron tip (length 16 mm, diameter 4.6 mm, 45°) for precision component soldering. It is compatible with QUICK-202/202D ESD, QUICK-303/303B ESD soldering stations. 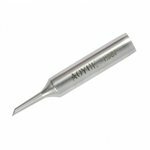 Replacement soldering iron tip with one-side cut for precision component soldering (45°, 17 mm). Compatible with ATTEN AT100D, AT201D, AT204D, AT60D, AT80D, AT937B, AT938D, AOYUE 701, 701A+, 936, 937, 937+, Lukey 936+, AOYUE 950+, AOYUE 738, 768, 899A+, 906, 906C, 908+, 909, 968, Lukey 702, 850D, 852D+, 852D+FAN, 852D-300-301, 853D+, 868, 898, HAKKO. 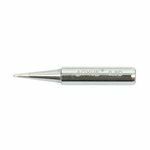 Bevel type replacement soldering iron tip (length 12 mm, diameter 5 mm, 45°) for precision component soldering. It is compatible with QUICK-202/202D ESD, QUICK-303/303B ESD soldering stations. 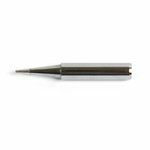 Bevel type replacement soldering iron tip (length 12 mm, diameter 3 mm, 45°) for precision component soldering. It is compatible with QUICK-202/202D ESD, QUICK-303/303B ESD soldering stations. 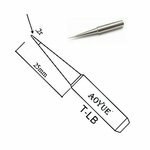 Long-life Bevel Type (45°, length 17 mm, diameter 4 mm) soldering iron replacement tip for precision component soldering. It is compatible with ATTEN AT100D, AT201D, AT204D, AT60D, AT80D, AT937B, AT938D, AOYUE 701, 701A+, 936, 937, 937+, Lukey 936+, AOYUE 738. 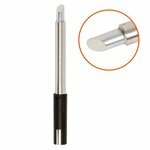 Long-life replacement soldering iron tip with double-sided cut for precision component soldering (17 mm, ⌀ 1.6 mm). It is compatible with ATTEN, AOYUE, Lukey soldering equipment. Bevel type soldering tip (length 12 mm, diameter 0.5 mm). Compatible with QUICK-202/202D ESD, QUICK-303/303B ESD soldering stations. 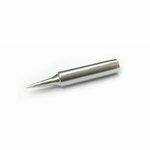 Replacement soldering iron tip (17 mm, ⌀ 3 mm) with one-side cut (45°) for precision component soldering. It is compatible with ATTEN AT100D, AT201D, AT204D, AT60D, AT80D, AT937B, AT938D, AOYUE 701, 701A+, 936, 937, 937+, Lukey 936+, AOYUE 950+, AOYUE 738, 768, 899A+, 906, 906C, 908+, 909, 968, Lukey 702, 850D, 852D+, 852D+FAN, 852D-300-301, 853D+, 868, 898, HAKKO.